Sickle cell nephropathy (SCN) is indicated by the presence of sickled erythrocytes in the renal medulla that result in decreased medullary blood flow, ischemia, microinfarcts and papillary necrosis in the kidneys. These pathologic changes result in tubular and glomerular function disturbances that affect blood pressure regulation and water and electrolyte metabolism [Table 1]. 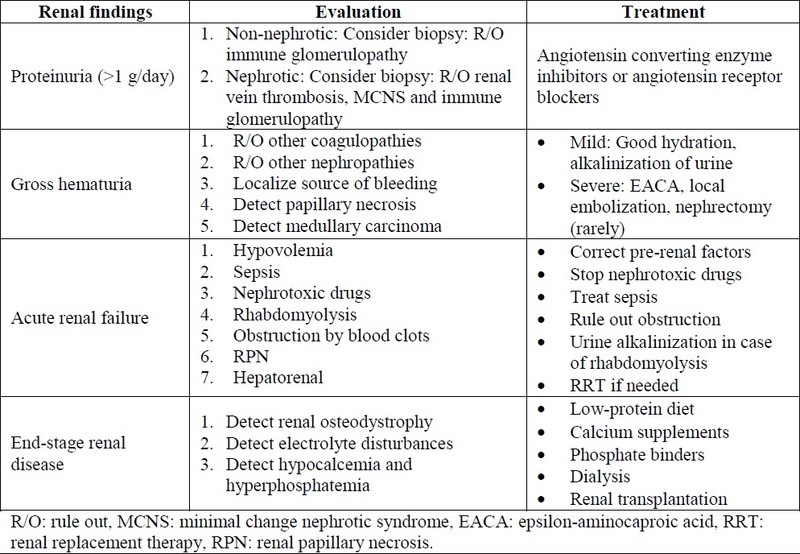 Although there are many studies showing that proteinuria, nephritic syndrome, chronic progressive renal failure and acute renal failure syndromes are the outcomes of SCN, the pathogenic mechanisms and potential therapies remain to be elucidated. Platt et al provide the most comprehensive analysis of life expectancy and risk factors for early death in sickle cell disease (SCD); 18% of deaths are ascribed to chronic end-organ involvement, predominantly renal. Patients with SCN who progress to end-stage renal disease (ESRD) have similar survival to those with non-diabetic ESRD. This article reviews the glomerular and tubular disorders associated with SCN and points to relevant pathophysiological and clinical implications. Table 1: Renal manifestations of sickle cell disease (SCD). Chronic sickling of blood cells underlies several mechanisms for kidney injury in SCN associated with low O 2 tension, hypertonicity and low pH of the renal medulla that promote the formation of hemoglobin polymers in the red cells with deformation of the sickled cells, and result in an increase in the blood viscosity, functional venous engorgement and interstitial edema, which predispose the renal microcirculation to ischemia and infarction. Obliteration of the medullary vasculature produces segmental scarring and interstitial fibrosis (structural papillectomy), which result in the formation of dilated renal pelvic capillaries and veins. Hematuria may result from rupture of vessels from the early venous engorgement or from the dilated vessels. The development of collateral vessels and their abnormal orientation in the medulla interferes with the countercurrent exchange mechanism, culminating through the years in an irreversible loss of medullary tonicity. Renal cortical blood flow and glomerular filtration rate (GFR) are increased perhaps by the secretion of the medullary vasodilator prostaglandins. Hyperfiltration coupled with glomerular hypertrophy can lead to glomerulosclerosis. ,, Once progression of the glomerular damage is evident, GFR begins to decrease, likely with some contribution from the ingestion of analgesics that can independently induce interstitial nephropathy. Guasch et al  documented a pattern of increased dextran permeability in the glomerular basement membrane of SCD patients, with an incremental increase in the pore radius. This would cause a non-selective proteinuria rather than the microalbuminuria associated with hyperfiltration. Bank et al  showed that in a transgenic sickle cell mouse model, there is an induction of nitric oxide synthase II (NOS II) in the glomeruli and distal nephron. This enzyme may increase the synthesis of nitric oxide leading to vasodilatation and contribute subsequently to hyperfiltration. Figure 2: Renal papillary necrosis: Pyelographic image in a patient with sickle cell disease showing central cavities within multiple papillae (arrows). 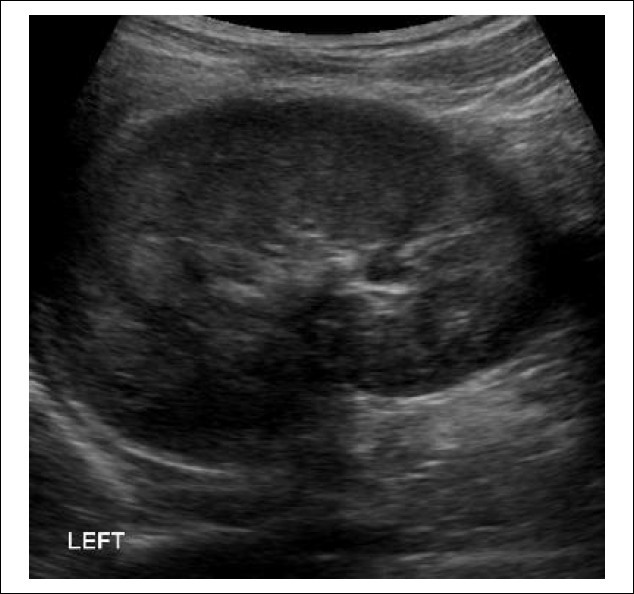 Figure 3: Renal papillary necrosis: Renal ultrasound showing increased echogenicity of the medullary pyramids in a patient with sickle cell disease. Increased reabsorption of phosphate and beta-2 microglobulin, as well as increased secretion of uric acid and creatinine, reflects excessive proximal tubule function, which may account for the overestimation of the true GFR measured with creatinine clearance in patients with the SCD,  and cystatin C clearance may be a better indicator. , Moreover, with the increased RBC turnover and consequent uric acid overproduction, most patients with SCD are normouricemic; uric acid clearance is greater in these patients. , However, urate clearance decreases with age and the incidence of hyperuricemia increases as renal function deteriorates. Maximum tubular reabsorption of phosphate is also increased in patients with SCD; therefore, serum phosphate is elevated in these patients [Table 1]. , Some studies report an increased plasma volume in the non-crisis steady state in the SCD patients. ,, Increased reabsorption of β-microglobulins has also been described. RBC sickling in the vasa recta is believed to interfere with the countercurrent exchange mechanism in the inner medulla. The resulting impairment of free water resorption manifests clinically as nocturia or polyuria [Figure 4]. Figure 4: Renal medullary changes that lead to hyposthenuria, papillary necrosis and hematuria in sickle cell disease. The impaired ability to concentrate urine, termed hyposthenuria, is the earliest manifestation of SCN. The ability to dilute urine remains intact and antidiuretic hormone (ADH) secretion remains normal in SCN patients with hyposthenuria, because the vaso-occlusive process spares the superficial loops of the loop of Henle (which are supplied by peritubular capillaries rather than by the vasa recta). In patients aged 10-15 years, urinary concentrating capacity may be restored with multiple transfusions of normal RBCs. Conversely, in patients older than 15 years, the concentration defect is often irreversible. An impaired ability to concentrate urine readily leads to volume depletion, especially in warm environments. Intravascular volume depletion potentiates the occurrence of sickle cell crisis and is treated with intravenous fluid hydration using isotonic saline. These observations have important clinical implications that include the possibility that relatively "normal" blood pressure levels actually represent significant hypertension with the attendant risks of adverse cardiovascular outcomes and that severe hypotension may ensue with the use of antihypertensive agents to lower intraglomerular pressure. Affected patients present with gross hematuria, urinary tract infection, flank pain, an abdominal mass and/or weight loss. , Metastatic disease is commonly present at diagnosis; thus, surgical resection is not curative. There is very limited experience in treating disseminated disease, ,, and the prognosis is dismal; survival after diagnosis is usually less than 6-12 months. ,, Thus, hematuria should prompt evaluation for this type of malignancy, particularly among younger patients with SCD or trait. Imaging (usually CT scan and intravenous pyelography) demonstrates a centrally located infiltrative lesion invading the renal sinus with peripheral caliectasis. The patients with SCD may develop proteinuria and renal failure that progresses into terminal chronic kidney disease (CKD). The renal involvement responsible is a glomerulopathy whose initial marker is albuminuria. The prevalence increases with age, ranging between 21.3%  and 28%  in patients aged 3-20 years, of which 10.5% of the cases progress to proteinuria within a 20-month follow-up period. In most cases (72%), CKD progresses into renal failure according to retrospective studies. A cross-sectional study involving 90 children reported that pre-hypertension and hypertension were independently associated with the presence of albuminuria. Prospective studies are needed to determine the causal relationship of these findings as well as the potential benefits of treatment on the development of albuminuria. In a recent prospective study involving 300 adults aged 20-70 years,  the prevalence of albuminuria was 68% (26% proteinuria) in homozygous individuals versus 32% (10% proteinuria) in heterozygous patients;  in this latter study, 21% of the patients had renal failure. However, increased tubular secretion of creatinine is maintained with the abnormal GFR. Albuminuria is a very sensitive marker for the glomerular damage caused in the SCD, unlike in other nephropathies such as type-2 diabetes. For this reason, some authors  have prefered measuring blood levels of cystatin C to serum creatinine for the estimation of GFR, although more studies are needed to confirm this recommendation. Four different types of glomerulopathies have been described in the SCD: Focal segmental glomerulosclerosis (FSGS), membranoproliferative glomerulonephritis (MPGN), glomerulopathy specific to the SCD and thrombotic microangiopathy (TMA). 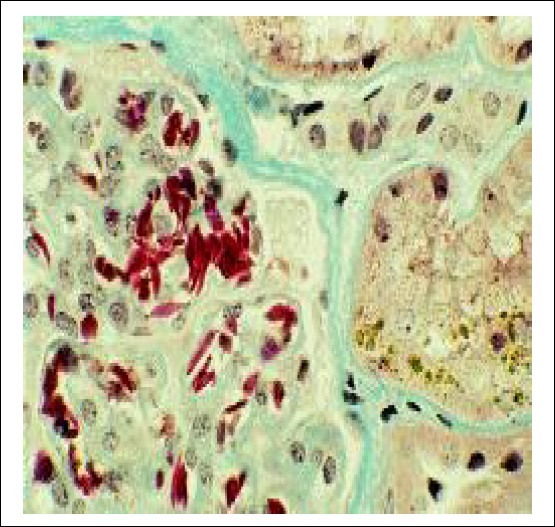 Regardless of which type of glomerular damage is present, all renal biopsies from the SCD patients show hypertrophied glomeruli with distended capillaries due to the sickled blood cells, which is described as a glomerulopathy specific to the SCD. Hemosiderin deposits in the tubular cells are an almost universal finding. 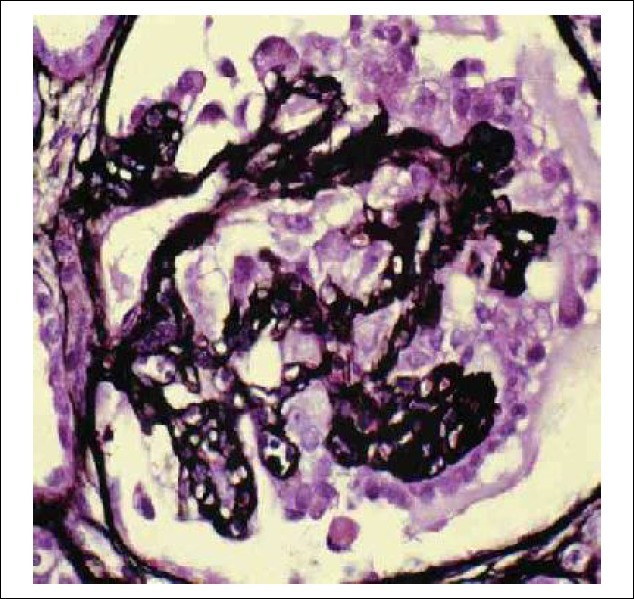 The most common glomerulopathy is FSGS, , which was observed in 39% of 18 renal biopsies from patients with the SCD [Figure 5]. Because this disease mainly affects juxtamedullary glomeruli vascularized by the vasa recta, it is frequently accompanied by severe medullary fibrosis. Both immunofluorescence and electron microscope analyses provide evidence of an absence of immune deposits. In a smaller percentage of cases, global glomerular sclerosis is observed. There have also been cases of focal cortical infarcts. The second most frequently observed type is MPGN, which was originally the first glomerular abnormality reported in SCD. Although it has been associated with nephropathy due to HCV and HIV, none of the five cases described in the study by Maigne et al  were attributable to this relationship. Indirect immunofluorescence studies can reveal immune deposits predominantly in the capillary wall including IgG, IgM, IgA, C3 and C1q. Interstitial fibrosis is found in most cases. The glomerular hypertrophy consistently found in the SCD could be at least in part secondary to chronic anemia (concordant with a lower prevalence of renal damage in the patients with the other types of less-anemic SCD, such as the HbSC). However, proteinuria in the SCD is neither universal nor is it related to the number or severity of crises, indicating that other factors are involved. Hyperfiltration, glomerular hypertrophy and FSGS are not necessarily sequential or causal. Some common mechanism may act in all the three conditions, such as growth factors or inflammatory cytokines. FSGS may be the cause and not the consequence of interstitial fibrosis. This could obstruct efferent arterioles thus increasing intraglomerular pressure and resulting in glomerular sclerosis [Table 2]. Table 2: Factors that may induce focal segmental glomerulosclerosis in sickle cell disease. The patients with SCD must be considered at-risk for CKD and should have regular (at least once per year) measurements of the urinary albumin to creatinine ratio (UACR) for early detection in children after 7 years of age, particularly in the severe cases of SCD. When patients test positive for albuminuria, we recommend measuring blood levels of cystatin C or using isotope analyses ( 99 Tm-DTPA, 125 I-iothalamate) for estimating GFR. The formulas recommended by the international guidelines for CKD screening programs in the SCD patients may not be useful unless there is a significantly altered GFR (<35-40 mL/min/1.73 m 2 ). Seropositivity must be tested for hepatitis virus and HIV due to the elevated prevalence of these diseases in SCD patients and their association with glomerulopathies. A kidney biopsy must be considered in cases of rapid-onset nephrotic syndrome or rapidly progressing kidney disease. Table 3: Diagnostic and therapeutic approach to patients with SCN. In one study, the incidence of AKI during vaso-occlusive crises was surprisingly low (<5%) and appeared to be limited to those with acute coronary syndrome and pulmonary hypertension, suggesting a potential role for right ventricular dysfunction and venous congestion. However, a higher incidence of AKI (10%) was reported in another study of hospitalized patients with SCD. Such a wide variation in results could probably be due to the differing criteria used to define AKI and its timing of onset. Transfusions or HU may have some protective value, especially because of the importance of anemia and hemolysis as risk factors for kidney disease. Treatment with HU has been shown to prevent the development of proteinuria in children and even decrease the rate of albuminuria. This drug improves anemia and erythrocyte rheology, reduces leukocytosis and modulates the expression of adhesion molecules. The combined use of ACE inhibitors and HU can prevent the progression of microalbuminuria to proteinuria,  although its effect in preventing renal failure has not been evaluated. Because the pathology of sickle cell hematuria is generally benign and self-limiting, a conservative treatment with bed rest is appropriate for avoiding the detachment of microthrombi. Forced diuresis should be maintained (at 4l/1.73 m 2 per day) using hydration, preferably with hypotonic solutions, along with administration of thiazide or loop diuretics. This will reduce medullary osmolality and may reduce cell sickling in the vasa recta as well as aid in eliminating clots in the urinary tract. Volume expansion with saline solution must be avoided as this would be ineffective at reducing blood osmolality, and transfusions can increase the risk of heart failure. Alkalization is also recommended as this is potentially useful for increasing the affinity of hemoglobin (Hb) for O 2 and decreasing the rate of cell sickling as well as the tubular toxicity of hemoglobinuria. However, this approach has not been proven as an effective treatment method. The use of -aminocaproic acid is reserved for those cases in which previous treatment methods have failed, and this method requires a great deal of precaution due to the high risk of thrombosis. In isolated cases of severe hematuria that has not responded to the previously mentioned treatment options, arteriography localization and selective embolization of the affected renal segment may ensue in order to prevent a nephrectomy. In any case, the treatment of hematuria must be included within the general treatment of SCD, especially the use of HU, which has been proven effective in both adults and children at reducing the incidence of crises with an acceptable safety profile. The use of anti-oxidant agents such as ascorbic acid could protect kidney cells from the oxidative damage of HU and increase safety. The incidence of hemodialysis-related complications does not appear to be different in the SCD patients when compared with the general dialysis population, although survival appears to be diminished. In a study using data from the United States Renal Data System (USRDS), of the 397 incident dialysis SCD patients, the 2-year mortality was similar to that of patients without SCD (33% and 37%, respectively). However, the SCD patients were substantially younger at the initiation of dialysis (mean age 40 versus 60 years). In the same study, an age-matched analysis of patients with a mean age of 35 years demonstrated a greater difference in survival (60 versus 80% at 3 years and 40 versus 70% at 5 years for patients with and without SCN, respectively). The frequency with which recurrence occurs in the allograft is not well documented. Miner et al  reported a case of a patient who developed a permanent decline in renal function 3.5 years after transplant due to recurrence of SCN and Chaterjee et al  provided another early case report of post-transplant renal allograft dysfunction that was not reversible by immunosuppression and was related to intravascular sickling. 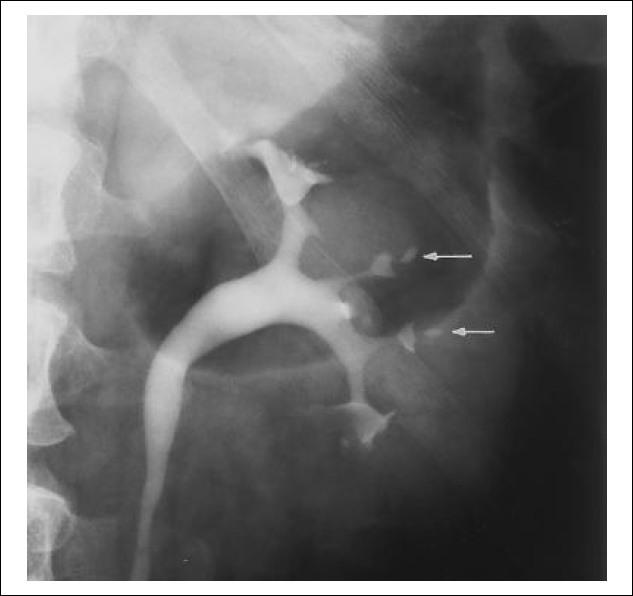 O'Rourke et al  recently presented a radiographic teaching case in which recurrent sickle cell involvement of the allograft presented as acute dysfunction, with biopsy findings of vascular congestion and patchy cortical necrosis. Because of the numerous transfusions such patients often receive prior to transplantation, the presence of pre-formed antibodies may pose a problem with regard to the donor organ and, thus, risk of rejection. Close monitoring of fluid intake and output should be performed post-transplantation. Fluid deprivation, excessive fluid loss and inability to ingest fluids can induce dehydration in the SCD patients more rapidly than in the normal population thus exposing the patient to the additional risk of a potential sickle cell crisis. 1. Platt OS, Brambilla DJ, Rosse WF, et al. Mortality in sickle cell disease. Life expectancy and risk factors for early death. N Engl J Med 1994;330:1639-44. 2. Pham PT, Pham PC, Wilkinson AH, Lew SQ. Renal abnormalities in sickle cell disease. Kidney Int 2000;57:1-8. 3. MogensenCE, Hansen KW, Nielsen S, Pedersen MM, Rehling M, Schmitz A. Monitoring diabetic nephropathy: Glomerular filtration rate and abnormal albuminuria in diabetic renal disease: Reproducibility, progression, and efficacy of antihypertensive intervention. Am J Kidney Dis 1993;22:174-87. 4. Thomas AN, Pattison C, Serjeant GR. Causes of death in sickle-cell disease in Jamaica. BMJ 1982;285:633-5. 5. Falk RJ, Scheinman J, Phillips G, Orringer E, Johnson A, Jennette JC. Prevalence and pathologic features of sickle cell nephropathy and response to inhibition of angiotensin-converting enzyme. N Engl J Med 1992;326:910-5. 6. Aoki RY, Saad ST. Enalapril reduces the albuminuria of patients with sickle cell disease. Am J Med 1995;98:432-5. 7. Serjeant GR, Serjeant BE, Forbes M, Hayes RJ, Higgs DR, Lehmann H. Hemoglobin gene frequencies in the Jamaican population: A study in 100,000 newborns. Br J Haematol 1986;64:253-62. 8. Scheinman JL. Sickle cell nephropathy. In: Barret TM, Avner ED, Armon WE, eds. Pediatric Nephrology, 4 th ed. Baltimore: Lippincott, Williams and Wilkins; 1999. p. 497-507. 9. Statius van Eps LW, Pinedo-Veels C, de Vries GH, de Koning J. Nature of concentrating defect in sickle-cell nephropathy. Microradioangiographic studies. Lancet 1970;1:450-2. 10. McInnes BK 3rd. The management of hematuria associated with sickle hemoglobinopathies. J Urol 1980;124:171-4. 11. Mostofi FK, Vorder Bruegge CF, Diggs LW. Lesions in kidneys removed for unilateral hematuria in sickle cell disease. AMA Arch Pathol 1957;63:336-51. 12. Osegbe DN. Haematuria and sickle cell disease. A report of 12 cases and review of the literature. Trop Geogr Med 1990;42:22-7. 13. Khan A, Thomas N, Costello B, et al. Renal medullary carcinoma: Sonographic, computed tomography, magnetic resonance and angiographic findings. Eur J Radiol 2000;35:1-7. 14. Wesche WA, Wilimas J, Khare V, Parham DM. Renal medullary carcinoma: A potential sickle cell nephropathy of children and adolescents. Pediatr Pathol Lab Med 1998;18:97-113. 15. Allen TD. Sickle cell disease and hematuria: Report of 29 cases. J Urol 1964;91:177-83. 16. Bennett MA, Heslop RW, Meynell MJ. Massive hematuria associated with sickle-cell trait. Br Med J 1967;1:677-9. 17. Chapman AZ, Reeder PS, Friedman IA, Baker LA. Gross hematuria in sickle cell trait and sickle cell hemoglobin-C disease. Am J Med 1955;19:773-82. 18. Turner JD, Milhorn HT Jr. Gross hematuria in a patient with sickle cell trait. Postgrad Med 1985;78:151-4. 19. Goodwin WE, Alston EF, Semans JH. Hematuria and sickle cell disease: Unexplained gross unilateral hematuria in Negros, coincident with the blood sickling trait. J Urol 1950;63:79-82. 20. Buckalew VM Jr, Someren A. Renal manifestations of sickle cell disease. Arch Intern Med 1974;133:660-9. 21. Marynick SP, Ramsey EJ, Knochel JP. The effect of bicarbonate and distilled water on sickle cell trait hematuria and in vitrostudies on the interaction of osmolality and pH on erythrocyte sickling in sickle cell trait. J Urol 1977;118:793-6. 22. Odita JC, Ugbodaga CI, Okafor LA, Ojogwu LI, Ogisi OA. Urographic changes in homozygous sickle cell disease. Diagn Imaging 1983;52:259-63. 23. Falk RJ, Jennette JC. Sickle cell nephropathy. Adv Nephrol Necker Hosp 1994;23:133-47. 24. Pandya KK, Koshy M, Brown N, Presman D. Renal papillary necrosis in sickle cell hemoglobinopathies. J Urol 1976;115:497-501. 25. Nagel RL. Sickle cell anemia is a multi-gene disease: Sickle painful crises, a case in point. Am J Hematol 1993;42:96-101. 26. Kaul DK, Fabry ME, Nagel RL. The pathophysiology of vascular obstruction in the sickle syndromes. Blood Rev 1996;10:29-44. 27. Nagel RL, Bookchin RM, Johnson J, et al. Structural bases of the inhibitory effects of hemoglobin F and hemoglobin A2 on the polymerization of hemoglobin S. Proc Natl Acad Sci USA 1979;76:670-72. 28. Chang YP, Maier-Redelsperger M, Smith KD, et al. The relative importance of the X linked FCP locus and beta-globin haplotypes in determining haemoglobin F levels: A study of SS patients homozygous forbeta S haplotypes. Br J Haematol 1997;96:806-14. 29. López Revuelta K, Ricard Andrés MP. Kidney abnormalities in sickle cell disease. Nefrologia 2011;31:591-601. 30. Lonergan GJ, Cline DB, Abbondanzo SL. Sickle cell anemia. Radiographics 2001;21: 971-94. 31. McCall IW, Moule N, Desai P, Serjeant GR. Urographic findingsin homozygous sickle cell disease. Radiology 1978;126:99-104. 32. Allon M, Lawson L, Eckman JR, Delaney V, Bourke E. Effects of non steroidal anti-inflammatory drugs on renal function in sickle cell anemia. Kidney Int 1988;34:500-6. 33. Alvarez O, Lopez-Mitnik G, Zilleruelo G. Short-term follow-up of patients with sickle cell disease and albuminuria. Pediatr Blood Cancer 2008;50:1236-9. 34. Powars DR, Elliott-Mills DD, Chan L, et al. Chronic renal failure in sickle cell disease: Risk factors, clinical course, and mortality. Ann Intern Med 1991;115:614-20. 35. Diamond HS, Meisel A, Sharon E, Holden D, Cacatian A. Hyperuricosuria and increased tubular secretion of urate in sickle cell anemia. Am J Med 1975;59:796-802. 36. Diamond HS, Meisel AD, Holden D. The natural history of urate overproduction in sickle cell anemia. Ann Intern Med 1979;90: 752-7. 37. Walker BR, Alexander F. Uric acid secretion in sickle cell anemia. JAMA 1971;215:255-8. 38. De Jong PE, de Jong-van Den Berg LT, Statius van Eps LW. The tubular reabsorption of phosphate in sickle-cell nephropathy. Clin Sci Mol Med 1978;55:429-34. 39. Smith EC, Valika KS, Woo JE, O'Donnell JG, Gordon DL, Westerman MP. Serum phosphate abnormalities in sickle cell anemia. Proc Soc Exp Biol Med 1981;168:254-88. 40. Barreras L, Diggs LW, Lipscomb A. Plasma volume in sickle cell disease. South Med J 1966;59:456-8. 41. Hatch FE, Crowe LR, Miles DE, Young JP, Portner ME. Altered vascular reactivity in sickle hemoglobinopathy. A possible protective factor from hypertension. Am J Hypertens 1989;2:2-8. 42. Wilson WA, Alleyne GA. Total body water, extracellular and plasma volume compartments in sickle cell anemia. West Indian Med J 1976; 25:241-50. 43. de Jong PE, de Jong-van den Berg LT, Sewrajsingh GS, Schouten H, Donker AJ, Statius van Eps LW. Beta-2 microglobulin in sickle cell anaemia. Evidence of increased tubular reabsorption. Nephron 1981;29:138-41. 44. Miller ST, Wang WC, Iyer R, et al. Urine concentrating ability in infants with sickle cell disease: Baseline data from the phase III trial of hydroxyurea (BABY HUG). Pediatr Blood Cancer. 2010;54:265-8. 45. Scheinman JI. Pediatric Nephrology. In: Holliday M, Barratt TM, Avner D, eds. Sickle cell nephropathy. Baltimore: Williams and Wilkins; 1994. p. 908. 46. Saborio P, Scheinman JI. Disease of the month - Sickle cell nephropathy. J Am Soc Nephrol 1999;10:187-92. 47. Bayazit AK, Noyan A, Aldudak B, et al. Renal function in children with sickle cell anemia. Clin Nephrol 2002;57:127-30. 48. Batlle D, Itsarayoungyuen K, Arruda JA, Kurtzman NA. 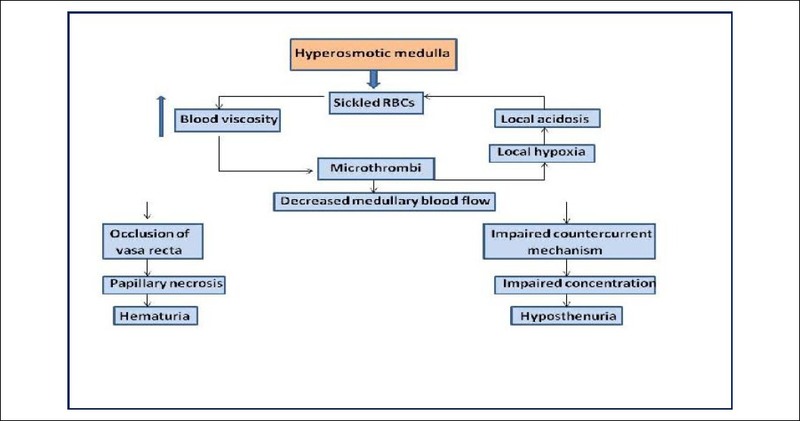 Hyperkalemic hyperchloremic metabolic acidosis in sickle cell hemoglobinopathies. Am J Med 1982;72:188-92. 49. de Jong PE, Statius van Eps LW. Sickle cell nephropathy: New insights into its pathophysiology. Kidney Int 1985;27:711-7. 50. Allon M. Renal abnormalities in sickle cell disease. Arch Intern Med 1990;150:501-4. 51. Bruno D, Wigfall DR, Zimmerman SA, Rosoff PM, Wiener JS. Genitourinary complications of sickle cell disease. J Urol 2001;166:803-11. 52. terMaaten JC, Serné EH, Bakker SJ, van Eps WS, Donker AJ, Gans RO. Effects of insulin on glucose uptake and leg blood flow in patients with sickle cell disease and normal subjects. Metabolism 2001;50:387-92. 53. de Jong PE, de Jong-Van Den Berg TW, Sewrajsingh GS, Schouten H, Donker AJ, Statius van Eps LW. The influence of indome-thacin on renal haemodynamics in sickle cell anaemia. Clin Sci (Lond) 1980;59:245-50. 54. Etteldorf JN, Tuttle AH, Clayton GW. Renal function studies in pediatrics. Am J Dis Child 1952;83:185-91. 55. Statius van Eps LW, Schouten H, La Porte-Wijsman LW, Struyker Boudier AM. The influence of red blood cell transfusions on the hyposthenuria and renal hemodynamics of sickle cell anemia. Clin Chim Acta 1967;17: 449-61. 56. Bank N, Aynedjian HS, Qiu JH, et al. Renal nitric oxide synthases in transgenic sickle cell mice. Kidney Int 1996;50:184-9. 57. Bank N, Kiroycheva M, Ahmed F, et al. Peroxynitrite formation and apoptosis in transgenic sickle cell mouse kidneys. Kidney Int 1998;54:1520-8. 58. Etteldorf JN, Smith JD, Tuttle AH, Diggs LW. Renal hemodynamic studies in adults with sickle cell anemia. Am J Med 1955;18:243-8. 59. Morgan AG, Serjeant GR. Renal function in patients over 40 with homozygous sickle-cell disease. Br Med J (Clin Res Ed) 1981;282:1181-3. 60. Alleyne GA. The kidney in sickle cell anemia. Kidney Int 1975;7:371-9. 61. Bhathena DB, Sondheimer JH. The glomerulopathy of homozygous sickle hemoglobin (SS) disease: Morphology and pathogenesis. J Am Soc Nephrol 1991;1:1241-52. 62. Statius van Eps LW, Schouten H, Haar Romeny-Wachter CC, La Porte-Wijsman LW. The relation between age and renal concentrating capacity in sickle cell disease and hemoglobin C disease. Clin Chim Acta 1970; 27:501-5. 63. Hakimi AA, Koi PT, Mihoua PM, et al. Renal medullary carcinoma: The Bronx experience. Urology 2007;70:878-82. 64. Davis CJ Jr, Mostofi FK, Sesterhenn IA. Renal medullary carcinoma. The seventh sickle cell nephropathy. Am J Surg Pathol 1995;19:1-11. 65. Swartz MA, Karth J, Schneider DT, Rodriguez R, Beckwith JB, Perlman EJ. Renal medullary carcinoma: Clinical, pathologic, immunohistochemical and genetic analysis with pathogenetic implications. Urology 2002;60:1083-9. 66. Avery RA, Harris JE, Davis CJ Jr, Borgaonkar DS, Byrd JC, Weiss RB. Renal medullary carcinoma: Clinical and therapeutic aspects of a newly described tumor. Cancer 1996;78:128-32. 67. Strouse JJ, Spervak M, Mack AK, Arceci RJ, Small D, Loeb DM. Significant responses to platinum-based chemotherapy in renal medullary carcinoma. Pediatr Blood Caner 2005;44: 407-11. 68. Schultz WH, Ware RE. Malignancy in patients with sickle cell disease. Am J Hematol 2003;74:249-53. 69. Lowe LH, Isuani BH, Heller RM, et al. Pediatric renal masses: Wilms tumor and beyond. Radiographics 2000;20:1585-603. 70. Halsey C, Roberts IA. The role of hydroxyurea in sickle cell disease. Br J Hematol 2003; 120:177-86. 71. Najean Y, Rain JD. Treatment of polycythemia Vera: Use of 32P alone or in combination with maintenance therapy using hydroxyurea in 461 patients greater than 65 years of age. The French Polycythemia Study Group. Blood 1997;89:2319-27. 72. Álvarez O, López-Mitnik G, Zilleruelo G. Short-term follow-up of patients with sickle cell disease and albuminuria. Pediatr Blood Cancer 2008;50:12363-9. 73. McKie KT, Hanevold CD, Hernandez C, Waller JL, Ortiz L, McKie KM. Prevalence, prevention, and treatment of microalbuminuria and proteinuria in children with sickle cell disease. J Pediatr Hematol Oncol 2007;29:140-4. 74. Becton LJ, Kalpatthi RV, Rackoff E, et al. Prevalence and clinical correlates of microalbuminuria in children with sickle cell disease. Pediatr Nephrol 2010;25:1505-11. 75. Guasch A, Navarrete J, Nass K, Zayas CF. Glomerular involvement in adults with sickle cell hemoglobinopathies: Prevalence and clinical correlates of progressive renal failure. J Am Soc Nephrol 2006;17:2228-35. 76. K/DOQI clinical practice guidelines for chronic kidney disease: Evaluation, classification, and stratification. Am J Kidney Dis 2002;39 (2 Suppl 1):S1-266. 77. Guasch A, Cua M, Mitch WE. Extent and the course of glomerular injury in patients with sickle cell anemia. Kidney Int 1996;49:786-91. 78. Zayas CF, Platt J, Eckman JR, et al. Prevalence and predictors of glomerular involvement in sicklecell anemia. J Am Soc Nephrol 1996; 7:1401. 79. Kato GJ, Gladwin MT, Steinberg MH. Deconstructing sickle cell disease: Reappraisal of the role of hemolysis in the development of clinical subfenotypes. Blood Rev 2007;21:37-47. 80. Maigne G, Ferlicot S, Galacteros F, et al. 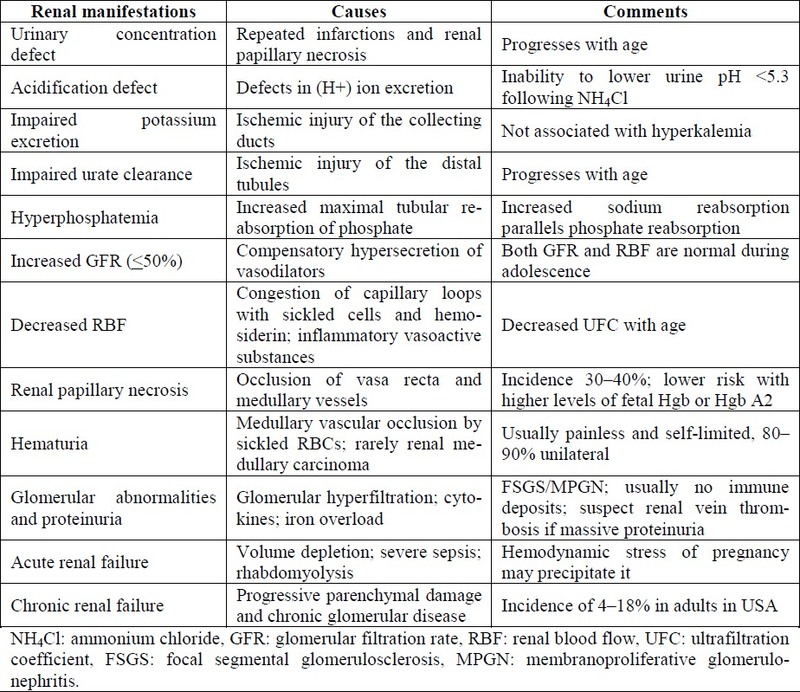 Glomerular lesions in patients with sickle cell disease. Medicine 2010;89:18-27. 81. Schmitt F, Martinez F, Brillet G, et al. Early glomerular dysfunction in patients with sickle cell anemia. Am J Kidney Dis 1998;32:208-14. 82. Scandling JD, Myers BD. Glomerular size-selectivity and microalbuminuria in early diabetic glomerular disease. Kidney Int 1992; 41:840-6. 83. Oleksyk TK, Nelson GW, An P, Kopp JB, Winkler CA. Worldwide distribution of the MYH9 kidney disease susceptibility alleles and haplotypes: Evidence of historical selection in Africa. PloS One 2010;5:e11474. 84. Sebastiani P, Solovieff N, Hartley SW, et al. Genetic modifiers of the severity of sickle cell anemia identified through a genome-wide association study. Am J Hematol 2010;85:29-35. 85. Sklar AH, Perez JC, Harp RJ, Caruana RJ. Acute renal failure in sickle cell anemia. Int J Artif Organs 1990;13:347-51. 86. Audard V, Homs S, Habibi A, et al. Acute kidney injury in sickle patients with painful crisis or acute chest syndrome and its relation to pulmonary hypertension. Nephrol Dial Transplant 2010;25:2524-9. 87. Abbate M, Zoja C, Remuzzi G. How does proteinuria cause progressive Renal Damage? J Am Soc Nephrol 2006;17:2974-84. 88. Peterson JC, Adler S, Burkart JM, et al. Blood pressure control, proteinuria, and the progress-sion of renal disease. The Modification of diet in renal disease study. Ann Intern Med 1995; 123:754-62. 89. Breyer JA, Bain RP, Evans JK, et al. Predictors of the progression of renal insufficiency in patients with insulin-dependent diabetes and overt diabetic nephropathy. The Collaborative study Group. Kidney Int 1996;50:1651-8. 90. Abdu A, Emokpae MA, Uadia PO, Kuliya-Gwarzo A. Proteinuria among adult sickle cell anaemia patients in Nigeria. Ann Afr Med 2011;10:34-7. 91. Wapstra FH, Navis G, de Jong PE, de Zeeuw D. Prognostic value of the short-term antiproteinuric response to ACE inhibition for prediction of GFR decline in patients with non diabetic renal disease. Nephrol 1996;4 Suppl 1:47-52. 92. Ruggenenti P, Perna A, Remuzzi G. Retarding progression of chronic renal disease; the neglected issue of residual proteinuria. Kidney Int 2003;63:2254-61. 93. Brenner BM, Cooper ME, de Zeeuw D, et al. Effects of losartan on renal and cardiovascular outcomes in patients with type 2 diabetes and nephropathy. N Engl Med 2001;345:861-9. 94. Yium J, Gabow P, Johnson A, Kimberling W, Martinez-Maldonado M. Autosomal dominant polycystic kidney disease in blacks: Clinical course and effects of sickle-cell hemoglobin. J Am Soc Nephrol 1994;4:1670-4. 95. Fitzhugh CD, Wigfall DR, Ware RE. Enalapril and hydroxyurea therapy for children with sickle nephropathy. Pediatr Blood Cancer 2005;45:982-5. 96. Steinberg MH, McCarthy WF, Castro O, et al, and investigators of the Multicenter Study of Hydroxyurea in Sickle Cell Anemia and MSH Patients Follow up. The risks and benefits of long-term use of hydroxyurea in sickle cell anemia: A 17.5 year follow-up. Am J Hematol 2010;85:403-8. 97. de Santis Feltran L, de Abreu Carvalhaes JT, Sesso R. Renal complications of sickle cell disease: Managing for optimal outcomes. Paediatr Drugs 2002;4:29-36. 98. de Jong PE, de Jong-van den Berg LT, Schouten H, Donker AJ, Statius van Eps LW. The influence of indomethacin on renal acidification in normal subjects and in patients with sickle cell anemia. Clin Nephrol 1983;19:259-64. 99. Van Eps S, De Jong PE. Sickle cell disease. In Schrier RW, Gottschalk CW, eds. Boston: Little, Brown and Company; 1988. p. 2561-81. 100. Brawley OW, Cornelius LJ, Edwards LR, et al. National Institutes of Health consensus development conference statement: Hydroxyurea treatment for sickle cell disease. Ann Intern Med 2008;148:932-8. 101. Wong WY, Elliott-Mills D, Powars D. Renal failure in sickle cell anemia. Hematol Oncol Clin North Am 1996;10:1321-31. 102. Abbott KC, Hypolite IO, Agodoa LY. Sickle cell nephropathy at end-stage renal disease in the United States: Patient characteristics and survival. Clin Nephrol 2002;58:9-15. 103. Steinberg MH. Erythropoietin for anemia of renal failure in sickle cell disease. N Engl J Med 1991;324:1369-70. 104. Roger SD, Macdougall IC, Thuraisingham RC, Raine AE. Erythropoietin in anemia of renal failure in sickle cell disease. N Engl J Med 1991;325:1175-6. 105. Kirkpatrick DV, Barrios NJ, Humbert JH. Bone marrow transplantation for sickle cell anemia. Semin Hematol 1991;28:240-3. 106. Ojo AO, Govaerts TC, Schmouder RL, Leicht-man AB. Renal transplantation in end-stage sickle cell nephropathy. Transplantation 1999; 67:291-5. 107. Warady BA, Sullivan EK. Renal transplantation in children with sickle cell disease: A report of the North American Pediatric Renal Transplant Cooperative Study (NAPRTCS). Pediatr Transplant 1998;2:130-3. 108. Chatterjee SN. National Study in natural history of renal allografts in sickle cell disease or trait: A second report. Transplant Proc 1987;19(2 Suppl 2):33-5. 109. Allen A, Scoble J, Snowden S, Hambley H, Bellingham A. Hydroxyurea, sickle cell disease and renal transplantation. Nephron 1997; 75:106-7. 110. van Ypersele de Strihou C. Should anaemia in subtypes of CRF patients be managed differrently? Nephrol Dial Transplant 1999;14 Suppl 2:37-45. 111. Breen CP, Macdougall IC. Improvement of erythropoietin-resistant anaemia after renal transplantation in patients with homozygous sickle-cell disease. Nephrol Dial Transplant 1998;13:2949-52. 112. Miner DJ, Jorkasky DK, Perloff LJ, Grossman RA, Tomaszewski JE. Recurrent sickle cell nephropathy in a transplanted kidney. Am J Kidney Dis 1987;10:306-13. 113. Chatterjee SN, Lundberg GD, Berne TV. Sickle cell trait: Possible contributory cause of renal allograft failure. Urology 1978;11:266-8. 114. O'Rourke EJ, Laing CM, Khan AU, et al. The case. Allograft dysfunction in a patient with sickle cell disease. Kidney Int 2008;74:1219-20. 115. Kar BC. Splenectomy in sickle cell disease. J Assoc Physicians India 1999;47:890-3. 116. Kazancioglu R, Sever MS, Yuksel-Onel D. Immunization of renal transplant recipients with pneumococcal polysaccharide vaccine. Clin Transplant 2000;14:61-5.